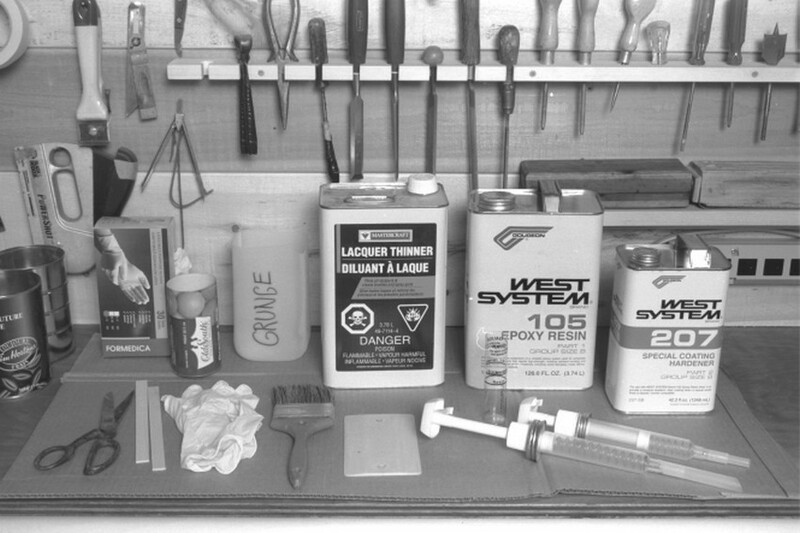 The WEST SYSTEM User Manual describes the basics of fiberglass cloth application and coating for clear finishing over wood. 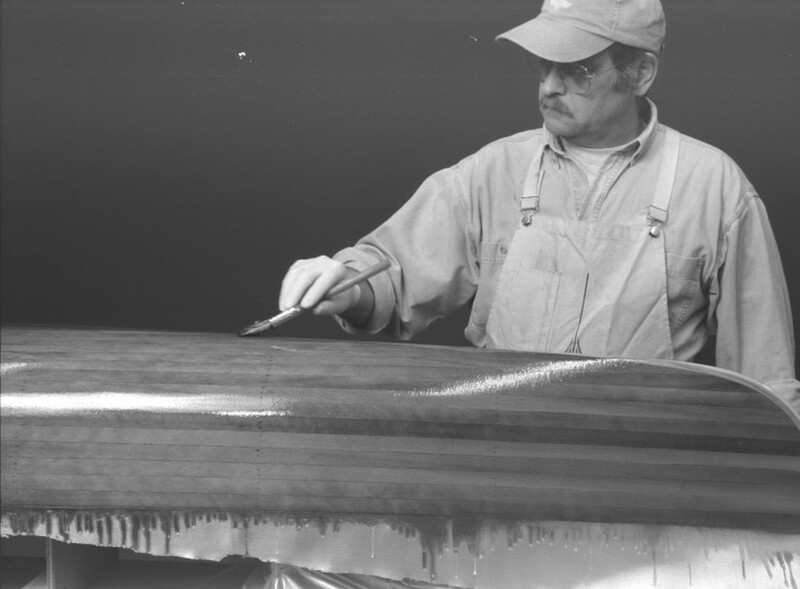 This article is the ultimate guide to applying fiberglass over a woodstrip hull to achieve a perfect finish. 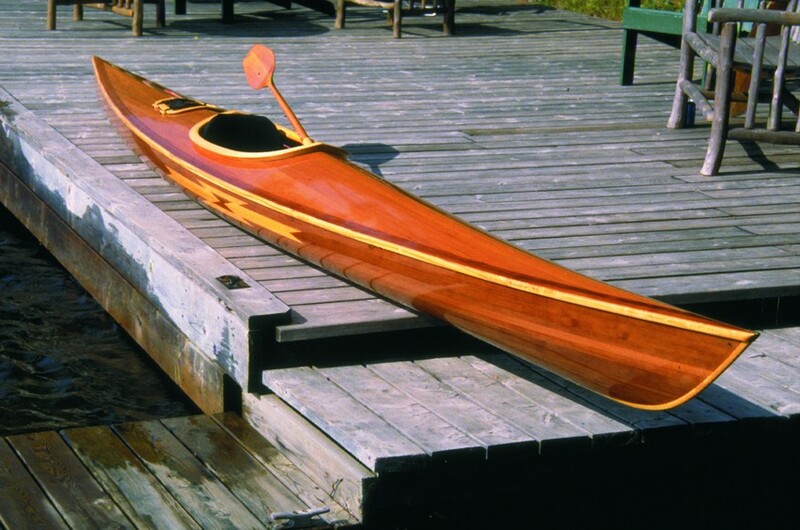 Ted Moores is a master of the perfect finish, author of CanoeCraft and KayakCraft and co-owner of Bear Mountain Boats. The secret to a clear coating is to control the film thickness of each layer of epoxy as it is applied. Building up the epoxy/glass over the wood may be compared to making a mirror. The prepared surface of the wood is the back reflective coating and the epoxy/glass is the glass or lens. In order to reflect the clearest image of the planking, the lens must be clean, smooth and of a consistent thickness. It is impossible to think of applying the epoxy resin in a haphazard manner and expecting to sand it back to a consistent film thickness. Also, when the epoxy builds up thick all at once, air is trapped inside and will appear as a white blemish or streak. If it is in the first coat, there is a good chance it will be in or below the surface of the cloth. Sanding will not remove these blemishes without cutting into the glass fiber, thus weakening the structure. Building the layers up evenly will involve a different technique for each layer. Each layer accomplishes a specific function and is controlled by specific limitations. On the outside of the hull where durability and visibility are prime considerations, three layers of epoxy resin and one layer of glass fabric are used. The glass fabric is always laid up in the first coat of epoxy, the second fills the weave and levels the surface, and the third buries the fabric, giving enough depth of resin to sand smooth without hitting the cloth. On the inside, consider omitting the third coat of epoxy. This surface will be less slippery yet look good. Also, this eliminates about 90% of the sanding of epoxy on the inside, a step that could be expected to take about one day to complete. The trick here is to be extremely careful squeegeeing the first and second coats. The texture of the weave must be consistent in order to look good. Think about this when you are squeegeeing the outside; this is a good place to practice getting an even texture. While technique and attention to detail are important for a good finish, it is also essential have the proper materials and have them on hand at the right time. It is important that the finish on the fiberglass cloth be compatible with the resin that you are using. After the glass fibers have been woven into cloth, it is fired to remove all the residual wax and oil and is then finished with a <%-2>coupling agent. The coupling agent is the interface between the glass fibers and the resin. Sticking well to both the glass and the resin, it keeps the bond from deteriorating. There are many different finishes available, but few are compatible with epoxy for our purpose. To be sure, buy your cloth from your epoxy dealer and ask if the finish is compatible with the epoxy. When you buy cloth, insist that it be carefully rolled. If it is folded, the creases will not come out. On the outside, there is a chance to sand them flat with the possibility of hitting the glass and having to patch it. On the inside if only two coats of resin are used, the wrinkle will remain visible. Look for a cheap natural bristle brush 2½” or 3″ wide with short bristles that are not too thick. A good varnish brush would not be a good choice as it holds a great deal of material. This is not only wasteful, but it is also hard to clean out. Old epoxy collects up inside and hardens before the project is complete. Because of its greater viscosity, epoxy resin should not be expected to flow out of the brush as freely as paint or varnish. Beware of ultra cheap “Chip” brushes with blonde bristles. They shed like a dog with the mange and the bristles are almost impossible to see on light colored cedar. All brushes are going to shed some when they are new, but a dark bristle will be easier to see. Shake out as many bristles as you can before using the brush for the first time. Take care of the brush. It gets better the more it is used. When you are finished using the brush or you feel it beginning to get stiff, scrape the excess resin out of the brush into a grunge can and then rinse it in lacquer thinner. Store the brush in clean lacquer thinner between coats and when finished coating, wash it with soap and water or a water soluble brush cleaner. Acetone will work as well as lacquer thinner, but I find the smell offensive and it seems to evaporate faster. Rollers sound like a good idea and almost work. However, when used for applying the epoxy to the dry cloth, there are several problems. It is tricky getting enough resin on to wet out the surface of the wood and the fabric. As the resin is squeezed out of the roller, air comes with it and gets trapped in the weave of the cloth. Also, the cloth has a tendency to stick to the roller and roll up as the roller passes over it. For applying the second coat of epoxy the roller is useless, as the weave is very coarse and will cause the resin to foam up. On the third coat, the roller will work. After rolling the epoxy out evenly over a 2′ or 3′ section, work the surface gently with the tip of a dry brush to break the bubbles. If you do use the roller for the third coat, a fourth coat would be worth considering as the roller does not build up the coating thickness as fast as the brush will. It is worth having a set of dispensing pumps that will give the correct ratio of resin and hardener with one stroke of each pump. WEST SYSTEM® mini pumps come with a volume/ratio tester. Use it. If there is a problem later, the question of the pumps’ reliability will be eliminated. Treat this piece of plastic as a precision tool. It is the key to a finish that looks like 12 coats of varnish. Check the edge for nicks and repair and soften the edge with 220 sandpaper. Use white, lint free cotton. Old white cotton bed sheets are ideal. Avoid colored fabrics as the dye could be dissolved by the lacquer thinner and transfer to the surface. One of the problems encountered using the squeegee is what to do with the waste resin (grunge) after it is picked up with the squeegee. If the waste is not removed from the squeegee after each pass, it is transferred to the beginning of the next pass. This leaves a line of waste resin where it should be clean. The can of choice is the rigid cardboard frozen juice can. Cut a slit ¾” down from the top edge and draw the squeegee through the slit. Both sides of the squeegee will be perfectly clean and the grunge will have run into the can. The length of the slit is important: if it is too deep, the sides of the can will spread and you won’t get a clean scraping action. The next problem is what to do with the grunge that is in the grunge can. As the volume of old resin builds up in the can, it will begin to heat up quite rapidly. At some point it will boil out over the top and run down the side. Not only could this be very painful, but the fumes are toxic. When you begin to feel the heat building up through the side of the can, dispose of the waste resin in a large disposal container with 2″ or 3″ of water in the bottom. The water will dissipate the heat and keep it from boiling. A large 2 liter disposable soft drink container with the top cut off will work well and you can watch the resin harden into some interesting shapes in the water. The optimum working temperature is about 70° F. If you are comfortable in a “T” shirt, it should be about right. At about 80° F, the working time will be reduced dramatically so watch the time between applying the resin and when you squeegee off the excess. Pick a time of day to begin the lay up that will give you the most comfortable working temperature. The second and third coat are affected less by the temperature and will be controllable in less than ideal conditions. Assemble all materials and supplies and set aside a block of time when you will not have to deal with distractions. This is a one shot deal and deserves your undivided attention. Clean the surface of the hull with a rag dampened with lacquer thinner to pick up the dust. This is not a washing step. Use only enough thinner to dampen the rag enough to hold the dust onto the cloth. Roll the cloth out over the hull leaving about 6″ extra at each end. With a person at each end holding the cloth in the middle, pull the cloth back and forth in a seesaw motion to center the cloth on the hull. While holding the cloth at the middle with one hand, use the other hand to work down to the edge, tugging against your partner ever 4′ or 5′. This exercise will shape the cloth perfectly around the hull. You should be able to manipulate the entire piece of cloth from the end. 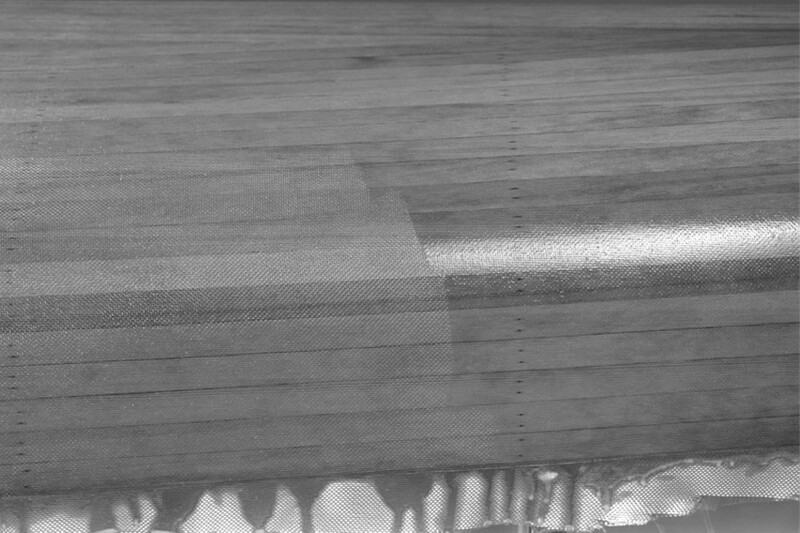 Use this technique if wrinkles develop in the cloth during the lay up. Trying to brush them out with your hand could put a permanent crease in the cloth. This is a good part of the project to have some help on. Break the duties down to mixer and applicator. They are both critical positions although if it is your boat, you may want to be the one in direct control of the visual aspects by applying and squeegeeing the resin. Don’t let anybody distract the mixer! Mixing requires great responsibility and concentration. There is no graceful solution to leaving one shot of hardener out of a batch that is being applied to the cloth. On the second coat, the resin could be washed off, but when it is in the cloth, more drastic solutions must be considered. Get into the habit of dispensing the resin first, followed by the hardener. Count to yourself or out loud if it helps: one (resin) one (hardener), two (resin) two (hardener), etc. Keeping to a system will reduce the odds of getting lost. If for some reason you have doubts about the accuracy of the ratio, discard the mix rather than take a chance on spoiling the lay up. When choosing the number of shots per batch, there are several things to consider. Once the resin and hardener are combined, a chemical reaction begins that produces heat and this heat produces more heat. The larger the batch, the faster the heat will be generated. As the heat builds, the epoxy loses viscosity and begins to thicken. This thicker resin will not soak into the surface of the wood or the glass fibers as far as the thinner, fresh resin will. You will see this as a lighter shade on the planking and the glass fabric could be visible. If you feel the resin beginning to heat up, discard it. Always use fresh resin. Tell the mixer just before you run out so that there will be a fresh batch of resin ready at the same time that you run out. Stir the resin/hardener mixture for at least 45 seconds, more if the resin is cool and stiff. Scrape the sides and bottom corners often and reverse the stirring direction from time to time. WEST SYSTEM® 105/207 has a pot life of about 15 minutes at 70°F, less as the temperature goes up, more as it goes down. If during the lay up you notice that the brush is getting stiff up around the ferrule, take the time to scrape out the old resin and rinse the brush in thinner. It is a good idea to scrape the excess resin out of the brush every 3 or 4 batches or when you see a lot of foamy resin in the brush. This will help to keep all the resin in the brush closer to the same age. 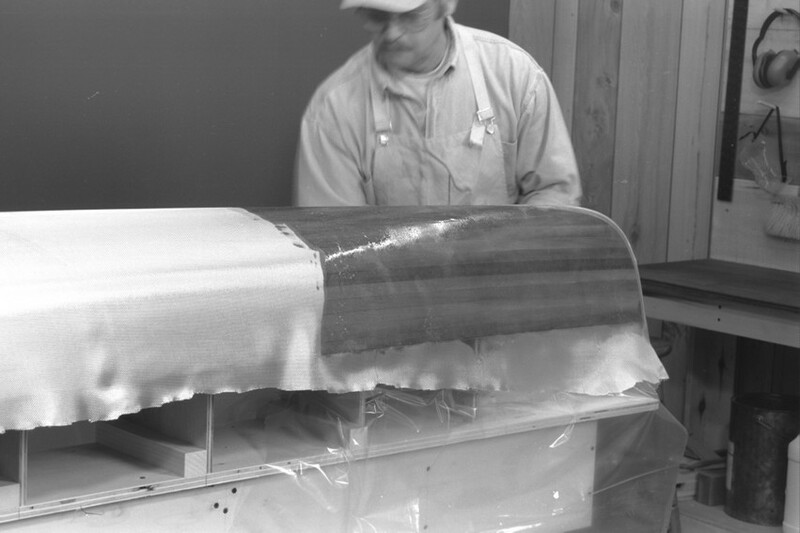 Applying the epoxy resin to the hull surface will require a different brush technique for each coat. The function of the brush on this coat is to transfer the resin from the can and to spread it gently over the dry cloth. There should be no attempt to work the resin into the cloth as this will introduce air bubbles into the resin that may or may not come out when it is squeegeed. Load the brush and spread with controlled but bold strokes. As you work aggressively ahead, keep an eye on the area that has just been covered. Watch for places where the cloth looks dry or starved and add fresh resin rather than pulling a run of questionable age over to it. Don’t mess with the runs a whole lot as they will be removed later with the squeegee. This is one place where working aggressively with disregard for neatness is the most appropriate thing to do. The fresher you can keep the resin at the edge, the more consistent the color will be. When you dip the brush, there will be resin on both sides of brush. Turn the brush over to transfer the resin from both sides of the brush to the surface. As the resin soaks in, notice how the cloth has become visible first around cracks and staple holes. The cloth works as a wick, effectively feeding resin into the voids. The surface of each plank will absorb the epoxy resin at different rates. It is important to supply enough resin to give each plank as much as it wants. Watch for dark heart wood planks as they seem to absorb more than light colored planks. When deciding where to begin applying the resin, the main consideration is keeping the edge of the resin fresh as you precede down the hull wetting out the cloth. This will depend of the size of the hull and the number of people involved. 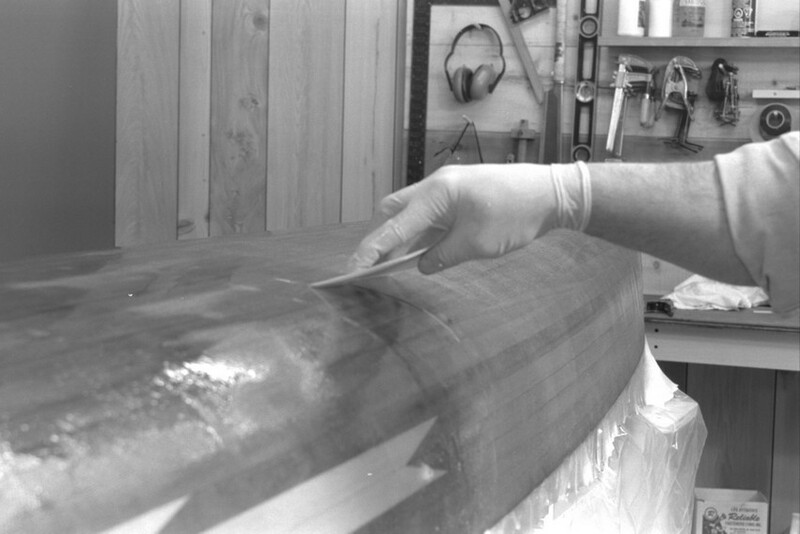 If you are working with just one person applying the resin, begin at the keel line about 3′ back from the end. Work down to the sheer and out to the end. This will tighten up the cloth and move the excess cloth out to the end of the hull. Repeat on the opposite side of the hull. Then move back to the side you began on for the third section. 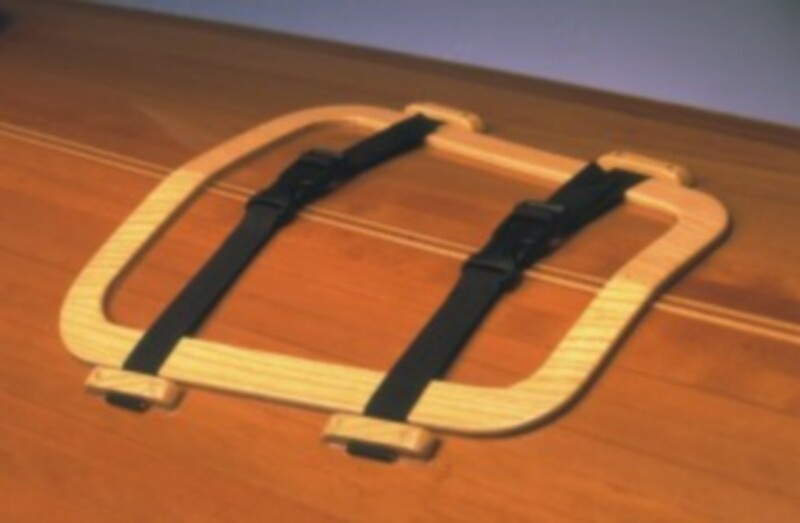 Change sides with each section of about 2′ to 3′ as you work down the hull. When the first section has been wet out, use this section as an anchor, working away from it to avoid bunching up the cloth. By the time you get to about the halfway point, the area first wet out should be ready for squeegeeing. It is important to squeegee only the first area, as the section beside it will be 5 to 7 minutes behind. You will alternate between wetting out one section and squeegeeing one section. If the mixer has a good idea of how you are applying the resin, he or she could fill in applying the resin until you catch up. This might be the trickiest step of the whole process and it governs what your boat will look like. It is very difficult to reverse and you need to be able to do it right the first time. While it is not a difficult step, you need to give it your full attention while you are doing it. 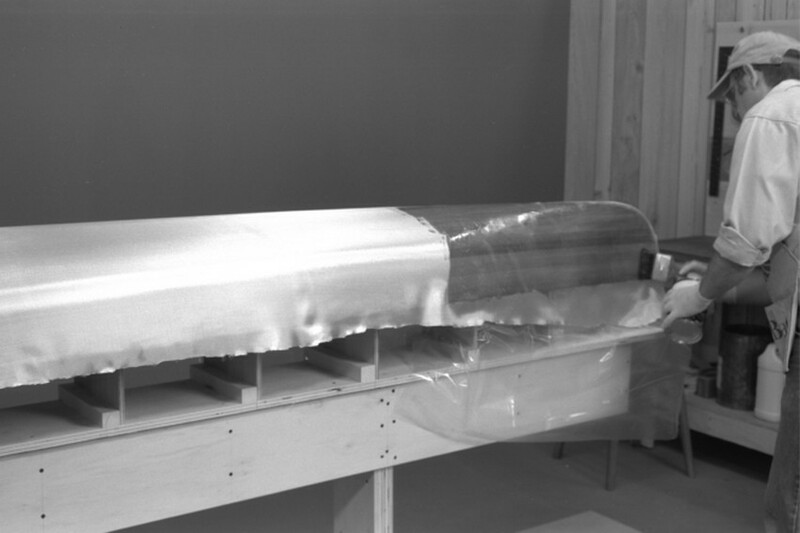 The purpose of the squeegee is to even out the film thickness by scraping off the excess resin. The planking has now accepted all the resin it wants; the cloth is saturated but floating in places. 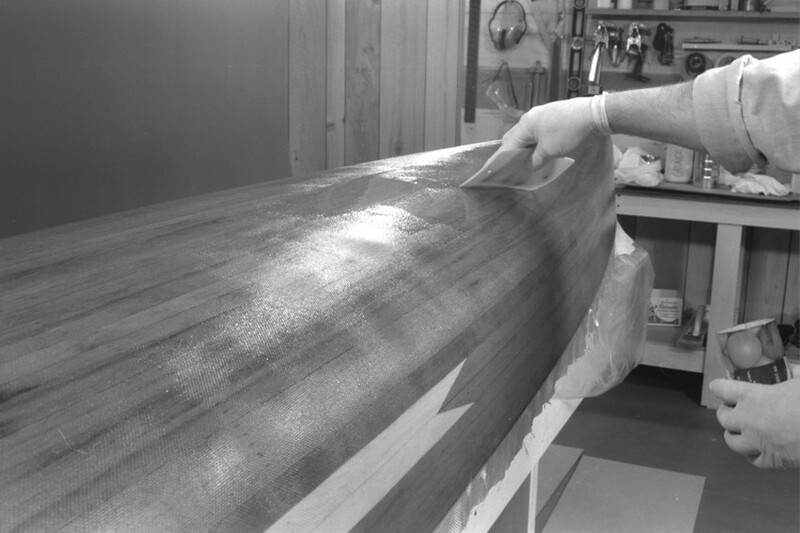 Squeegeeing will leave the cloth evenly saturated and lying flat on the hull. As most plastic squeegees have a slight curve along the edge, hold it so that the corners turn up. Turned over, the corners will dig in and scrape too much resin out of the cloth. Hold it so that your thumb is on the bottom side and your fingers are spread out to control the pressure along the edge. 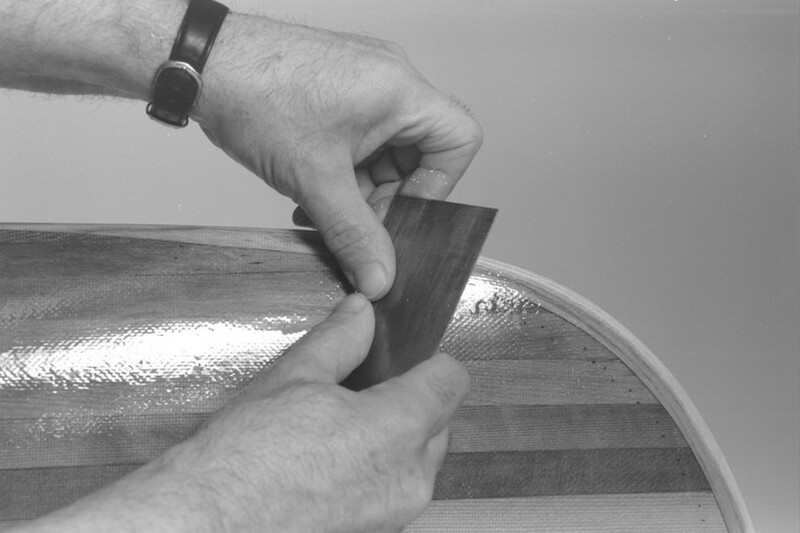 The angle that the squeegee is presented to the hull is most critical. The angle should be quite flat with your thumb almost dragging on the hull. A steeper angle will put too much direct pressure on the cloth and too much resin will be scraped out. Be conscious of keeping this low angle as you go around the turn of the bilge. There is a tendency to allow the angle to get steeper as you come around the turn of the bilge. If too much pressure is applied, too much of the resin will be squeezed out of the cloth. This is undesirable as after the resin sets up, the fibers of the cloth will be coated and sealed but not filled. The second coat will not be able to penetrate the fibers any further and the glass fibers will remain visible. This will be most noticeable in bright sun light on dark wood. If you don’t press hard enough, the surface will remain shiny and the cloth will be floating. In practice, it is a good idea to work a section down in stages rather than trying to get it all in one pass. 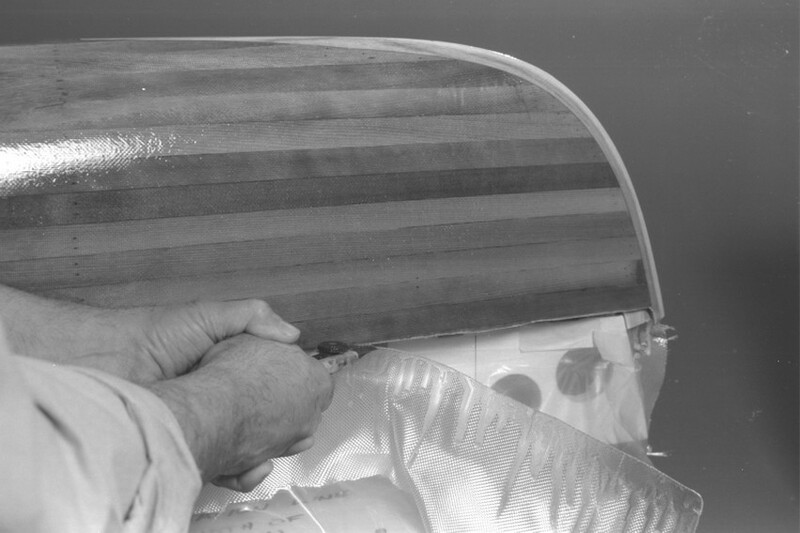 Begin at the centerline (keel line) of the hull and draw the squeegee down to the sheer with overlapping strokes. The speed should be slow enough to allow the resin to roll up in front of the squeegee. The amount the successive passes overlap will depend on how much resin is being removed. If there is a lot of resin, pick up only as much as you can hold on the squeegee and transfer to the grunge can. As you get closer to the desired film thickness, use the full width of the squeegee. Work gently over the section until the vertical shiny tracks are removed. In practice, you won’t get all of them, but try to get as even a texture as possible without wasting too much time. 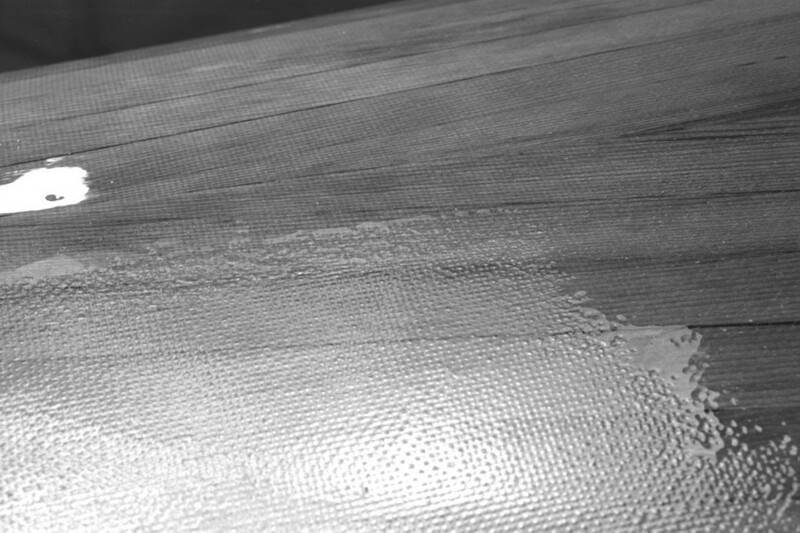 Keep in mind that this is practice for getting an even texture on the inside where it will be more visible. As you work these last tracks out, be very conscious of not taking too much and starving the cloth. If too much resin is removed, the cloth will have a subtle white glitter rather than a saturated dull shine. Should this happen, add fresh resin rather than dragging old resin over to it. Wet the cloth out on both sides. Then trim it to about 1″ past the end of the stem. Check that the cloth is lying down flat to the hull along the edge. After the resin has firmed up (about 3 hours), trim it off clean with a sharp knife and soften the edges with 120 sandpaper. The purpose of the second coat is to fill the weave and level the surface of the cloth. No attempt should be made at this point to build up the resin thickness. The surface is too coarse to brush on without the resin foaming up as well as the danger of air being trapped at the bottom of the weave. The minimum time between coats is about 3 hours or when you are able to trim the cloth without the resin sticking to the knife. The three coats should go on as close together as possible. Applying before the previous coat has cured will result in a chemical bond as well as a mechanical bond. If you can time it right (about 4 to 5 hours), a quick hand sanding with 120 grit will take the tooth off and make the surface easier to work on. Since the depth of the weave is being reduced, slightly less resin will be required to level the weave. If it has been more than about 8 hours since the last coat was applied, the surface should definitely be sanded. This is important because the integrity of the bond between the layers now depends on the layers being mechanically bonded together. On a horizontal surface or on the inside, it is possible to pour a small puddle of resin on the surface and then spread it around with the squeegee. 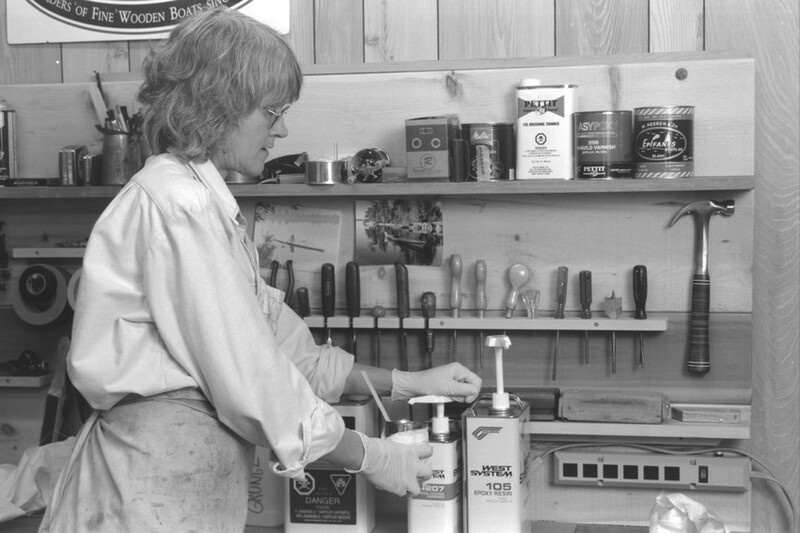 The technique that works for me on the outside is to use the brush to transfer the resin from the container to the hull. Since the brush is depositing more resin than is necessary to fill the weave, only spread the resin about 1/3 of the way down from the centerline. This should be just enough resin to fill the weave all the way down to the sheer line. The first time over, concentrate more on filling the weave than making it look good. Work the resin aggressively enough to force the trapped air out of the craters in the weave. After roughly spreading each batch, go back over the section systematically, scraping off and disposing of the excess resin. Use a steeper angle and slightly more pressure on the squeegee this time to force the air out and to level the surface. The part that is most likely to get missed is the vertical surface along the sheer line. Check for dull patches that would indicate an area that has been missed. It is hard to see on the vertical surface so check from all angles. Listen to the squeegee. As it passes over a dry patch, you will hear a harsher sound. If there is a problem getting the vertical tracks out, try working in a fore and aft direction. On the inside where you want to get rid of all the tracks, go over the surface with a dry brush. This may be a reasonably aggressive motion in a fore and aft direction. Check that the ends of the stems have been coated evenly. The purpose of the third coat is to bury the glass cloth with enough epoxy resin that the surface may be sanded smooth without hitting the cloth. How to apply the third coat This coat will be applied with a familiar painting motion. Since you are now working on reasonably smooth substrata, a more aggressive motion may be used without introducing air into the resin. If you do see bubbles forming excessively, be less aggressive. The idea is to apply as much resin as you can get on in an even film thickness without it running. You will have to use your judgment to find this balance between just right and too much. Too much will give the brush a mushy, skidding feel while too little will have noticeably more resistance. Controlling the film thickness by feel is often more reliable than doing it visually, especially if the light is marginal. In practice, you will use a combination of both what you can see and what you can feel. Load the brush and apply to a section about 3′ long or as long a section as you can work comfortably. Spread with a long vigorous but controlled back and forth motion to work the resin out into an even film thickness. Check for even film thickness by brushing up and down, feeling for consistent resistance through the brush. After spreading the resin over the section being worked on, go back to where you started and finish off with long, flowing fore and aft strokes. This motion should be like an airplane landing and taking off gently to help the resin blend in evenly with the adjoining sections. When applying resin beside a completed section, work from the wet to the dry to keep the resin from building up too thick along the overlap. There is a limit to how long you can play with working the runs out. At some point, the resin will begin to firm up and will pile up and not flow out. This is the time to quit because from this point on, working it will only make it worse. A premium resin system like WEST SYSTEM 105/207 has good self-leveling properties. While this is desirable for getting rid of brush marks, it is also what causes the resin to run. Don’t take a few runs on this coat too personally as they happen to all of us. Remove the runs after the resin has cured with a sharp cabinet scraper. Trim the excess cloth after the third coat has hardened. When the final coat has cured thoroughly, sand to prepare the surface for varnish, beginning with 80-grit paper and finishing with 120-grit. Apply four coats of premium spar varnish for UV protection.